Plus Size Kitten: Loccitane's Provence Promotion! Calling all Loccitanies! Quick go buy the RM40 stamp card from Loccitane. 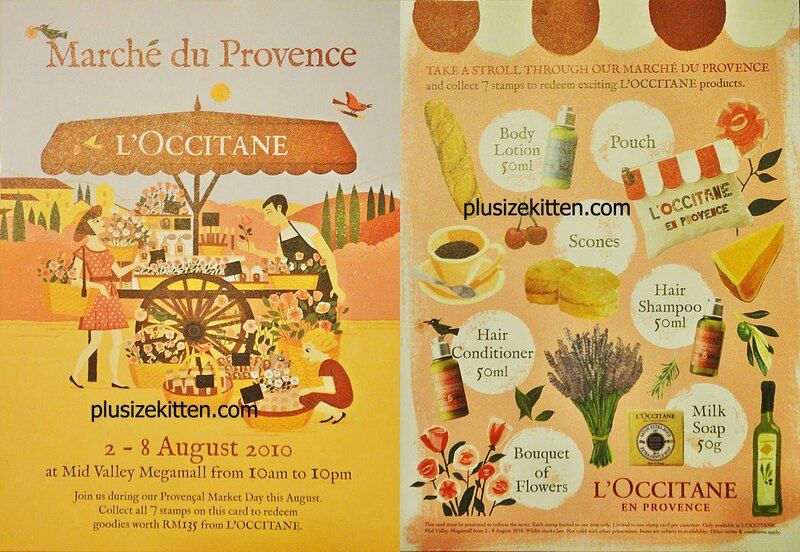 The RM40 card enables you to collect 7 stamps for items at the Provence Market promotion on 2-8th August, 2010 at Mid Valley from 10am to 10pm. I heard there's limited stock of cards for each outlet and that only one person per card can redeem it at this event. It's RM40 now, if you buy it when the event starts, it's going to be RM50 (Fatin told me). What you'll get is 50ml shampoo, conditioner, body lotion, pouch, flowers, soap 50g and scones! this is interesting. I can't wait to check this place out! I wondering what is the event about? and do we need to do anything to get those stamps?? or just attend the event will do? Am also wonderin too..mayb ask us to collect 7 stamps by askin us to buy stuff? Or there is a contest for us to collect 7 stamps? Jean: hmmm normally stamp card collection requires you to visit/do something at that particular booth in order to receive a stamp. Not very sure how Loccitane is going to organized theirs. i'm waiting for clinique then i decide whether i'm gonna get this.. greedy me! lol! Fatin: which clinique set r u getting babe? Irene: happy shopper man u! glad u bought ur card oledi! let us have fun at the event yap! all go fist day to enjoy!! im really looking fwd to it! ur going on the first day? yes of coz! won't miss it! how bout u irene?